SPD Tuning Service Based in Los Angeles California. Owned and operated by the very knowledgeable Mike Shields. JC Sports Based in Denver, Colorado. Minnam Racing Based in Vancouver, British Columbia. Makes two different turbo kits for Subaru's. Middleteam Rally Team is based in New South Wales, Australia. They have many custom built parts for Subaru's (turbo or not), and also sell Prodrive and STi parts. 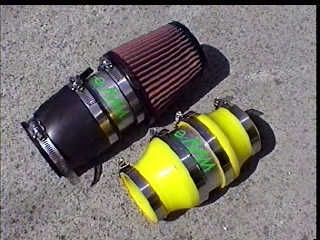 Makes two different supercharger kits for Subaru's. A Turbo-Zet is an electric turbocharger. Available in single fan or dual fan models, it is capable of increasing engine power by 10% or more (G Tech and Dyno Proven!). The fans turn at 6,000 to 80,000RPM depending on a signals from the ignition coil. The fans roll on magnetic bearings to provide an MTBF of 20,000 hours of operation. Cost is between 600 and 800 Singapore dollars depending on model. Dollar for doller this is a better upgrade than a turbocharger, provided you are only looking for a 15 - 20HP gain. Another version of an electric turbo charger. This one is called the E-Ram and is made in California. It takes a much simpler approach than the Turbo-Zet. It simply spins a larger fan at 20,000RPM when at Full Open Throttle (FOT). Power gains are not as good as the Turbo-Zet, but this one costs a bit less at $300 US. Shox.com sells struts, springs and other suspension parts via mail order. There prices seem to be the best going. For Subaru's ask for KYB GR2 struts, KYB ASX adjustable struts, and H&R OE Sport Springs. http://www.kyb.com KYB Shocks and Struts. Makers of OEM Subaru struts. For the aftermarket they make the excellent GR2 struts to fit the Legacy and Impreza models, and now have their adjustable ASX struts for Subarus. Unorthodox racing manufactures an underdrive pulley that will fit any Subaru EJ series engine. The pulley is smaller in diameter than the stock crankshaft pulley to drive the alternator, A/C compressor and power steering pump as slower speeds so they will have lower parasitic loss. Net gain is about 6% more power to the wheels. This pulley is not recommended for engine speed sensing power steering systems.